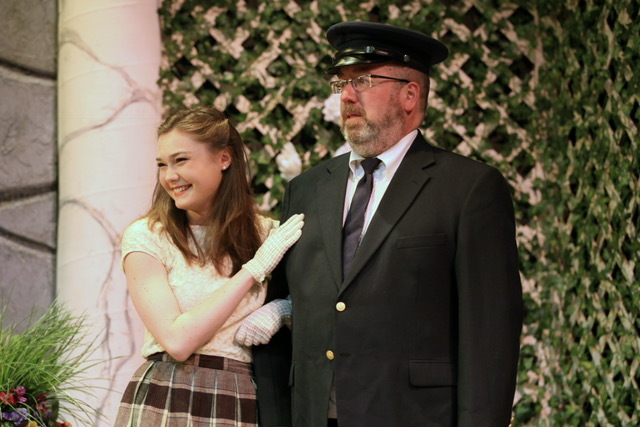 In staging “Sabrina Fair” Rick Wright, director of the Edmonds’ Driftwood Players, is giving area audiences a rare chance to see the original Broadway play by Samuel Taylor which was used as the basis for two film adaptations. The most well-known adaptation was made in 1954, the year after the play debuted on Broadway, and starred Humphrey Bogart and Audrey Hepburn. 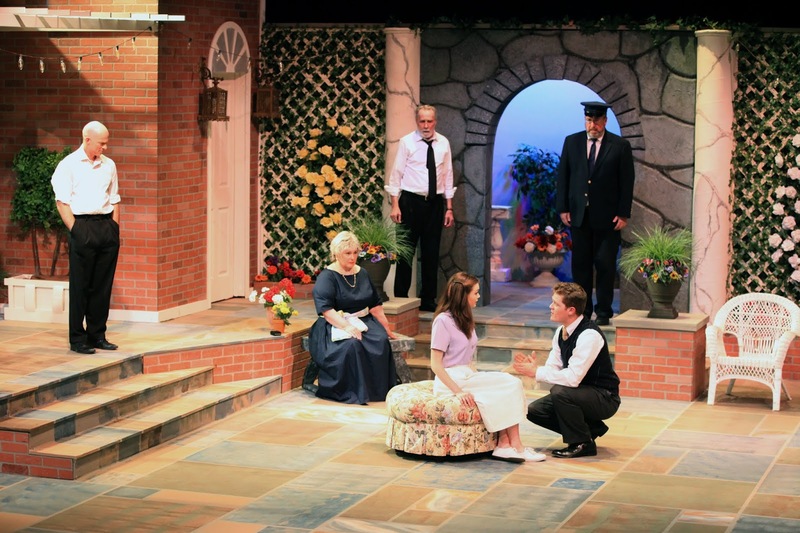 This well-staged production played to an enthusiastic capacity crowd at its premiere on Friday night, June 8th. The warm and friendly atmosphere of the theater was fun to participate in. 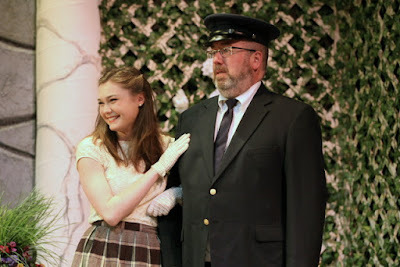 The play itself is a refreshing departure from the well-known movies, with just enough differences to make curious ears perk up when we learn things like Sabrina spent five years in Paris working for NATO instead of going to a Cordon Bleu cooking school. It’s an upstairs/downstairs kind of story (only the downstairs part is played by an apartment over a garage) as the chauffeur’s daughter returns from Paris to become an object of desire — between two brothers. The cast worked well together, and it was easy to tell they relished their parts. 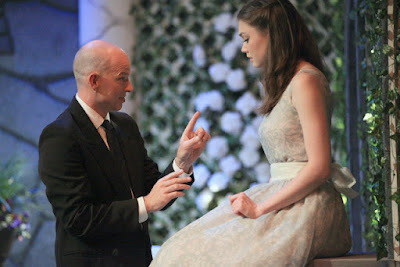 Rebecca Erickson’s Sabrina was charming and sincere, two qualities required of the role. Asa Sholdez as Linus Larrabee Jr. effectively played the transition in his character from calculatingly cold captain of industry to one with much warmer charm. Laura Crouch as Linus’s mother Maude was convincing as a ‘helicopter mom’ to her grown sons. In this version of the story, Linus Sr., played with gusto by Martin J. Mackenzie, sold his schooner and took up attending funerals, a twist that was sad to lose in the movie version. The reactions of cook Margaret, played by Elizabeth Shipman, gave a moral center to the piece. Nathaniel Grant Thompson, the younger Larrabee brother David, lent a credible quality of entitlement to his role as someone who is experienced at manipulating his parents to get what he wants. Terry Boyd as Sabrina’s father, a man cleverer than his employer, was appropriately reserved in his portrayal of the snobbish chauffeur who looks upon her engagement to a Larrabee as a step down for his daughter. James Milton as Paul D’Arenson, Sabrina’s rich Frenchman, was an entertaining inclusion to the Hollywood storyline that had written out his character. Dr. Kathleen Sansett as Julia, Maude’s recuperating friend, had just the right combination of wisdom and humor to make her role stand out. The creative crew did fine work as well and deserve mention, including director Rick Wright, stage manager Sean Morrone, assisted by Erin Sutter, producer Diane Jamieson, assisted by Julie Adams, and designers Nancy Johnson, Julia Stainer, Brent Stainer, and Chantal Burns who also served as French language coach. Sorry to get so serious here, but there’s nothing like an evening at a community theater to realize just how lucky we are and just how much we have to share with those who aren’t. Re-experiencing this frothy story of the trials of the rich at a time when so many are struggling was a bit uncomfortable for me at first. I had really loved it in the form of the original movie when I was a girl. And then I realized, the story hadn’t really changed (too much), I had. Seeing the rich at play no longer leaves me thinking of the great time I’d have living in a mansion on the North Shore of Long Island — I think instead of all of those who don’t even have homes. Watching family dramas unfold on stage left me thinking of all the parents and children who have been torn from each other’s arms for seeking a safer life. And who could blame them for wanting to come here? To a place where people can freely gather to enjoy an evening together? To a town where community members generously support the arts and creative people have the freedom to express themselves doing things they love? To paraphrase Managing Director Kim Smith in her program notes, Sabrina helps the Larrabees save themselves from their narrow-minded view of the world and see the bigger truth that choosing love is always best. That message is one we need now, more than ever. Performances run until June 24th on Thursdays through Saturdays at 8pm and Sundays at 2pm. Regular tickets are $28 unless you are a senior, a junior, or in the military. Then they are $25. Certain performances include ASL interpreters which is a wonderful public service. Kudos to Kim Smith for a helpful press kit. The performance was a longish 2 hours and 45 minutes including intermission so be prepared to get home late. The theater is located at the very lovely Wade James Theater, 950 Main St., Edmonds, WA. Check www.edmondsdriftwoodplayers.org for more information or to purchase tickets. To purchase tickets by phone, call 425-774-9600, option 1.